SPECIAL OFFERS: Try our Fruit Smoothies and Frozen Coffee Drinks. Perfect for those hot summer days. MORE ABOUT Whereabouts Cafe: Paris... Looking in the front window, Whereabouts Cafe appears to be the type of coffeehouse that belongs in Rittenhouse Square or Greenville. You expect the food to be mediocre, the coffee overrated, and the employees rude. You would be gravely mistaken. The moment you walk in the front door, you are instantly transported to a Parisian Cafe; a community gathering place where the relationships between coffee and food is just as important as the human ones. Second, you notice two distinct aromas, fresh baked bagels - over 25 varieties - and coffee, the type of coffee that makes you take the extra five minutes to drive to the plaza, get out of your car, and stand in line before work every morning. Finally, you notice the most astonishing thing of all, the relaxed atmosphere, no attitudes, no rudeness, and no drama. Whereabouts Cafe is a place where you can actually feel your shoulders relaxing. The cafe is open weekdays 6am-3pm and weekends 7am-3pm. Whereabouts offers corporate and private catering and can be rented for private events. Stop by and discover Whereabouts Cafe. 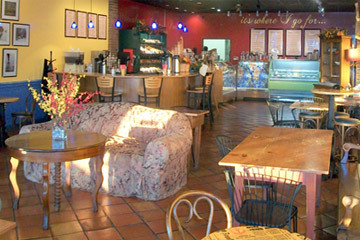 214 Peoples Plaza, www.whereaboutscafe.com, 302-836-3365.